Panfish can suspend anywhere in the water column and a big equation for locating fish and putting together a pattern is dialing in that productive zone. Before electronics, anglers often fished down through the entire water column. The edge that sonar gives us today is that we can speed up the process of getting back down to fish which makes us more efficient. What also happens, as we race back down to a school that might be 15 feet below the transducer, is we miss the high fish or leave fish that might not show up well on electronics. The reason high fish are so often overlooked today is because when we use sonar, the cone angle is often merely a few feet wide, at most, for the top six feet of the water column. If visibility allows, anglers can often sight high fish but there are also a few adjustments that enable your Vexilar to be more effective when looking for fish that are in some cases a few feet below your boots. The first step is stretching that cone angle as much as possible. Drill the holes as straight down as possible and hang the transducer as high as possible in the center of the hole. Many anglers will actually use the foam leveling device as an arm to hang the transducer in the center of the hole, often just a few inches under the water. As simple as it sounds, keep the jig or presentation right below the transducer. Keep the transducer in the middle of the hole and keep the rod tip right above the transducer so that the presentation is also hanging right below the transducer. Remember that the cone angle can often be extremely small so if you are hanging the transducer on one side of the hole and you are fishing down the other side, you might be off by as much as six inches, which can make a big difference for seeing your presentation and watching for fish when your cone angle might only be a foot wide a few feet under the ice. Sonar is fast and nimble where you can run and gun easily, but underwater cameras, like the Vexilar Scout can also be really deadly for figuring out high fish. Panning with an underwater camera is a great way to look for fish that are hanging below the ice, perhaps the best way. For actually catching fish, hang the lens so that it down views and lower the lens in the hole far enough where you can essentially sight fish without needing a dark house. Some areas offer great sight fishing opportunities and if water visibility allows, sight fishing inside a blacked out “Fish Trap” is educational, productive and enjoyable. Over the past ten years, I have been gravitating toward smaller diameter augers when targeting panfish but sight fishing shallow water and high fish is still one scenario where I really like drilling a bigger hole, as I can peer and see to the sides of the hole so much better. There are bodies of water where anglers are really in-tune to fishing high in the water column and anticipate this pattern. Thus these anglers are set up to capitalize on these fish. However, in other regions, some anglers have trouble fishing in the top tier of the water column, often the result of the pattern not being as prominent. There are many situations however, when high, under the ice patterns shine, especially for big fish. I have my own opinions and theories, but I believe we often find some of the biggest panfish right under the ice. The bigger fish feel more confident and safe, where as the small fish don’t seem to like to leave the security of either the school, weeds or bottom and be silhouetted. Big fish also get to you faster, so if there is a pack of 20 fish swimming ten feet down and they rise up to investigate you… guess who gets to you first? That said, some of the best baits for exploring these patterns are often larger profiled soft plastics that not only have a tendency to flip the trigger of big crappie, in particular, but can also be seen from a distance below. My confidence bait right now for big crappie high in the water column is a Makki Plastic Jamei rigged onto a Clam Tackle Duck Bill Drop Jig. I like how this combination swims in the water. The new Clam Tackle Cavier jig is another great shallow water crappie killer that really bounces nice when worked and gives soft plastics a nice vibration and action. Crappie are notorious for riding right under the ice but there are also times when we have seen sunfish and perch ride this highflying pattern as well. Pressure ridges and ice heaves often attract fish. Frozen weed fragments hanging from the ceiling of ice are also sweet spots. Not every day, necessarily, do you find fish a foot or two under the ice but it happens enough that it should definitely be a pattern to check as you search for fish. 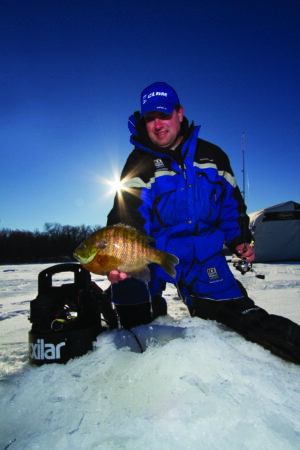 When fish seemingly disappear from the water column as the day progresses or don’t show up in the usual locations, take the high road to some of the biggest panfish caught each winter.